Scheduler: SalesForce source block daily update refresh? 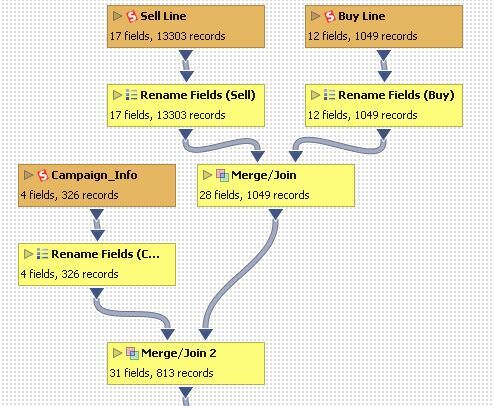 I have set-up a job to pull information from different Salesforce tables, combine and then publish this data. The template works and the data is updated and published as expected however when I try to schedule the task it shows the attached warning. Oddly the data is still published when the task is tested but the job will not run when scheduled. I have also set-up an email notification for when this chain action fails however I am not sent an email even though this process has also been tested. Any suggestion on how I can get this to update daily as needed? 1) You can safely ignore the first line regarding the registry: "Could not open windows registry node... returned error code 5". It has nothing to do with your job not working. 2) Useful information in the dialogue is letting you know that you do not have any linked sources configured (sources in the iok file). Thanks for your comment- glad I can ignore the first part of the warning. What can you suggest that I try to get this job to update once a day? Scheduler will prompt you to set the Recurrence for each action (once a day, once a month...), also you probably wish to schedule the Save job at the end. I have set the job to refresh every 5 mins while I test but still it doesn't refresh automatically. 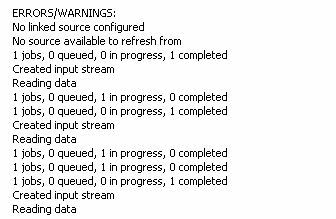 when I go into the scheduler and test the action I get the attached message - the data is published as expected. How come it works when I test it but not when it is scheduled? If when I open the file there I can connect to Salesforce with no problem why does it now say 'No linked source configured' ? did you find out how you solved this?